LONDON--(BUSINESS WIRE)--Technavio analysts forecast the global teeth whitening market to grow at a CAGR of almost 4% during the forecast period, according to their latest report. The research study covers the present scenario and growth prospects of the global teeth whitening market for 2017-2021. The analysts have presented the various facets of the market with a particular focus on identifying the key industry influencers. The use of teeth whitening products among individuals is limited in developing and under-developed nations due to high price and lack of awareness. However, an increase in education levels, especially in rural population has led to a rise in adoption of teeth whitening products. The market is growing at a steady rate as the teeth whitening products are easily available in most parts of the world and is increasingly becoming popular with the desire to have a good physical appearance. The desire to have white and clear teeth induces consumers to buy teeth whitening products. Previously, endeavors to help the appearance of teeth were limited to straightening crooked teeth. Currently, advanced whitening products are available that can enhance the appearance of teeth by removing stains and treating discolorations. Cosmetic dentistry is one such dental service to have gained popularity over a period. Globally, there has been a shift among the general population from wanting to be considered as 'patients' to now viewing themselves as healthcare "consumers" with alternating behaviors, expectations, and needs. Consumers are becoming more selective in healthcare purchases and are seeking value for their spending. Studies across the world have started to indicate that consumers are ready to become more active, informed decision makers who spend a considerable amount to shop for the best products in terms of quality and price. “Consumers are increasingly using digital and social media but it is still not being used to its complete potential as a significant portion of the population is still not utilizing it. Hence, the vendors should focus on digital and social media marketing to increase product visibility, thereby leading to a strong online brand image that would translate into sales,” adds Amber. In the past two decades, the American Dental Association (ADA) Council on Scientific Affairs has monitored the development of teeth whitening products. The number of teeth whitening products has gone up exponentially. To increase the adoption of teeth whitening products among consumers, manufacturers are partnering with several dental associations to promote the advantages of using the teeth whitening products. Approval from such dental associations encourages customers to invest in teeth whitening products for enhancing their appearance. Manufacturers are also taking this opening to market these products by adding such associations' approvals to the products' labels. Recommendations from dentists for using teeth whitening products are also aiding to increase the demand from consumers. Become a Technavio Insights member and access all three of these reports for a fraction of their original cost. As a Technavio Insights member, you will have immediate access to new reports as they’re published in addition to all 6,000+ existing reports covering segments like lab equipment, outdoor gear, and agriculture equipment. This subscription nets you thousands in savings, while staying connected to Technavio’s constant transforming research library, helping you make informed business decisions more efficiently. 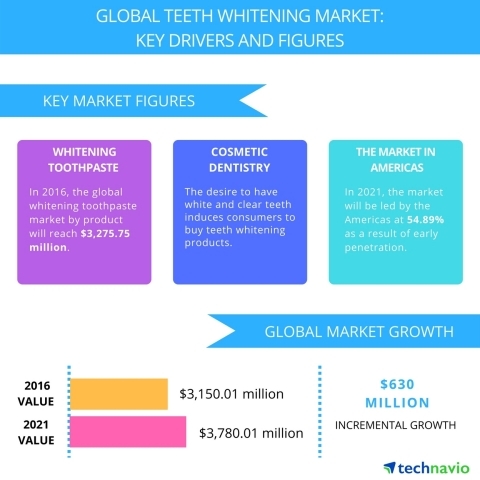 Technavio analysts forecast the global teeth whitening market to grow at a CAGR of almost 4% during the forecast period, according to their latest report.